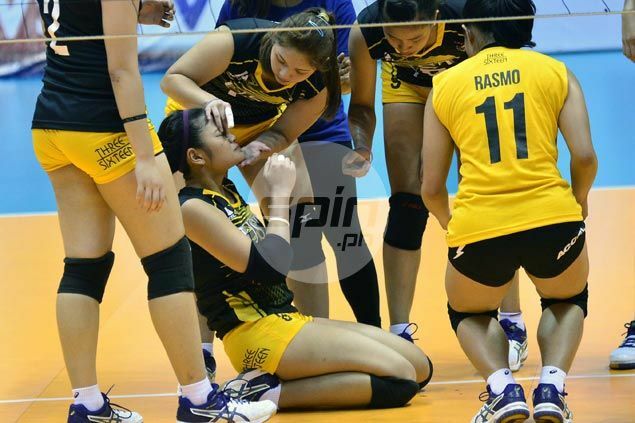 UNIVERSITY of Santo Tomas’ Mela Tunay was rushed to the hospital with a bloody nose after colliding with teammate Pam Lastimosa during a match against Technological Institute of the Philippines on Sunday in the V-League Collegiate Conference at The Arena in San Juan. Tunay was taken by her family to the UST Hospital in Espana, Manila. The fifth year player said she felt dizzy but can walk to the car outside the player's entrance, although medics carried her out for precautionary measures. “Nahihilo ako… Pero kaya ko maglakad,” she said.